I'm Navin Surtani - an engineer for JBoss by Red Hat. This blog is primarily for work and extra things related to my job around the South East Asia region. At the recently concluded Red Hat Tech Exchange in June, I presented a demo of how to make use of the cross-site replication feature that is included in JBoss Data Grid. The majority of the work for the demo was done previously by Tristan Tarrant (https://twitter.com/tristantarrant), so many thanks go to him of course. The YouTube link is over here. So go ahead and have a look! 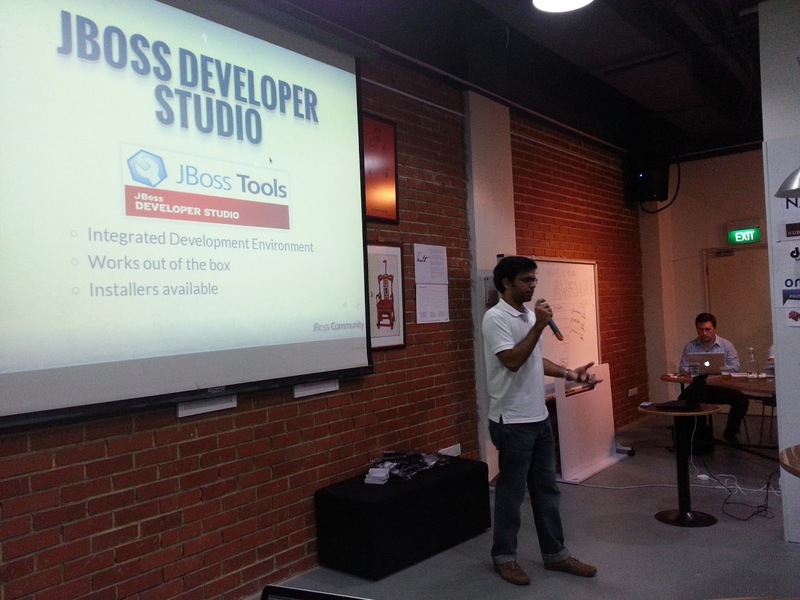 A couple of weeks ago we held another iteration of the Singapore JBoss User Group. We managed to have an external speaker in which I was glad about. The man is Ramkumar K.B. and he works for Standard Chartered Bank (SCB) in Singapore. They're one of our local JBoss customers. Ram spoke about how they applied the JBoss Fuse for a mobile banking application in Indonesia. It provided some interesting insight as to how people in the real world are making use of Fuse along with the process of building from scratch up to actually deploying the project live. Furthermore, it's interesting for us at JBoss because there is a drive towards a mobile application platform (http://aerogear.org/) which will allow enterprises to swiftly and easily develop mobile applications for their businesses. Naturally, Ram and his team were very happy with making use of our technology given that he proudly advertised that the number of lines of code was very low while using Fuse while comment lines were in abundance. The fact that they had the time to run these analytics alone was surprising enough! The crowd was actually quite small, that's because we tried a new format - single content presentation and an earlier time in order to capture a more attentive audience. I think that even though there weren't many people present, the few who were there were very interested in the content presented by Ram and the discussions were very engaging. Probably a good time here to express my thanks towards Ram and everyone in the Singapore team who helped put the event together. Thought I'd add in an extra little plus here to tell you what else is happening and what else is around the corner. I have been helping some interns locally while they are building this year's Red Hat Challenge (http://goo.gl/mBkieN). I'm pretty impressed with the quality and speed of their work and we have our fingers crossed that when the challenge goes live at the end of October it will go through smoothly. I'll be sure to write up a blog post on my thoughts there by the end of the project. For the next JBug iteration, we are looking at having our next event at some point in the middle of October. Once again, keep your eyes and ears open for news on that. As usual - thanks to all for reading up! It's been a while since the previous blog, so my apologies for that. There is important news from our front in Singapore. We have already held not one, but two JBoss User Groups at The Hub in Singapore. The first event was held on the 18th of April this year and the second on the 22nd of May. It's a great idea that has a lot of potential in a region where the interest in technology is on the upswing. 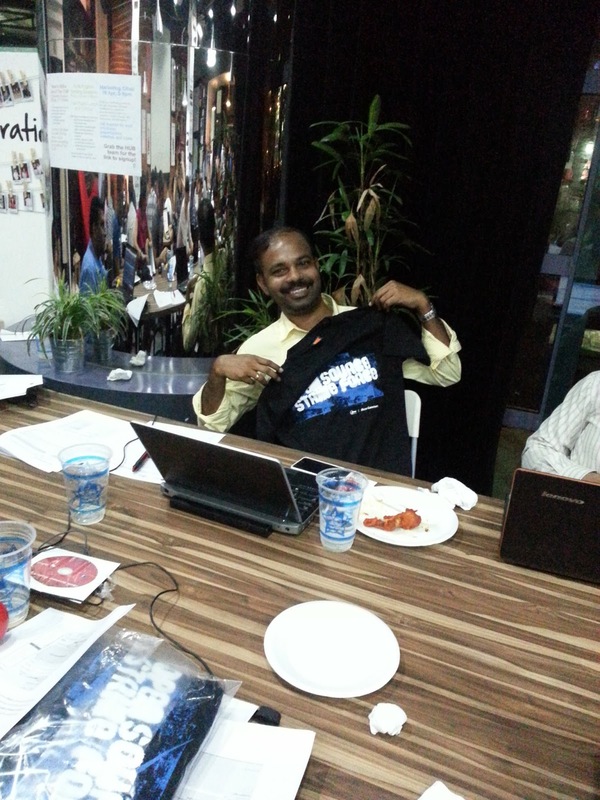 Free beer, pizza, t-shirts and lots of hacking. What can go wrong? 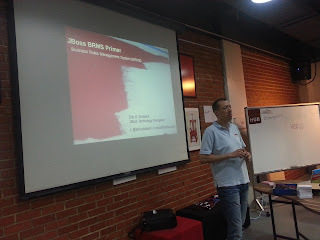 Bruno Georges (a Director of JBoss Engineering) inaugurated the first Singapore JBoss User Group by discussing the JBoss Way and introducing a new audience to what we do as a Community. It was an important way to start our first event as it slowly gave people a little bit more insight to who we are and how we go about things. I went up next and instead of running the same demo that I had done previously (as I have blogged about), I decided to actually make the audience build and run the demo as a workshop. It was a better idea to have a hands-on workshop since that way people wouldn't get bored and fall asleep. I think the workshop paid off as people seemed quite interested in what they had to do. As Red Hat employees it turned out to be quite fun since we gave out a bunch of freebies for people who managed to complete the workshop. 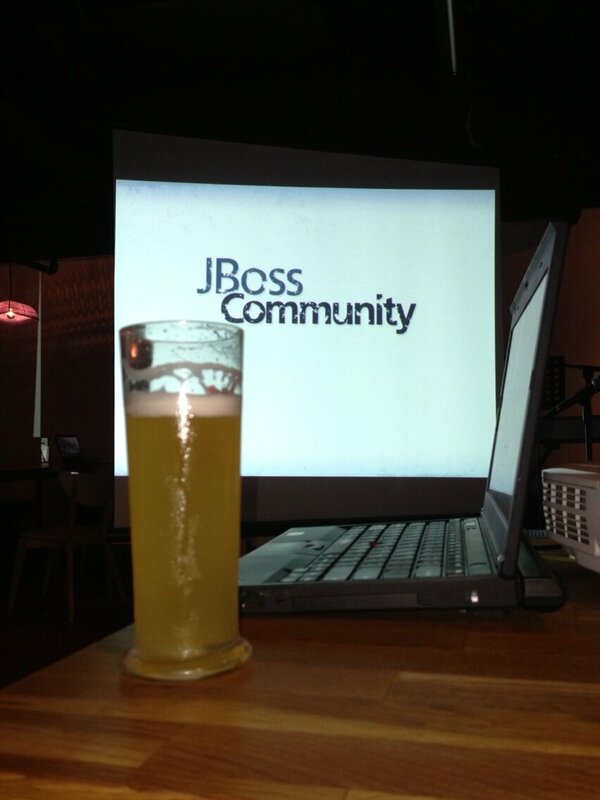 For the second event, Bruno provided a State of the Union of JBoss. 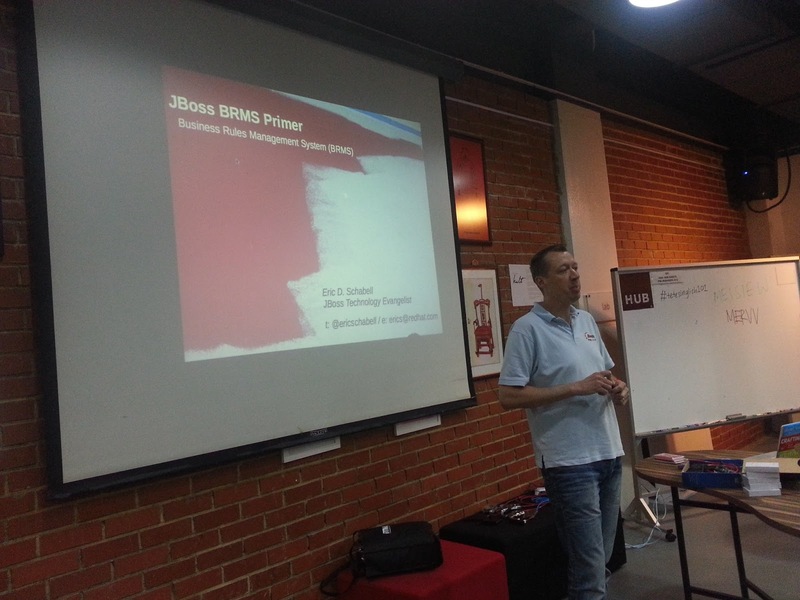 He also explained the reasons behind the renaming of the JBoss Application Server to WildFly. He ran a workshop showing people how to use JBoss Forge to build and deploy applications to the application server which most people seemed to get the hang of eventually. Finally, there was even a little snippet of time for him to demonstrate how to build a clustered application using JBoss, but running on Rasperry Pis - which was pretty cool in my opinion. 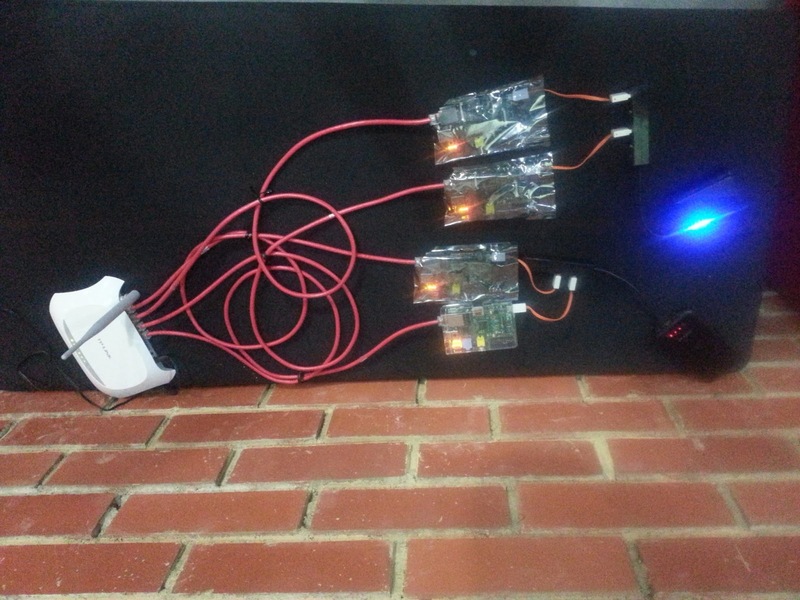 No, not the dessert kind of Raspberry Pi. BRMS (or Drools) evangelist Eric Schabell was also present and ran his BRMS primer for our audience. Eric ran a workshop to get people some basic hands-on experience with using the rules engine to put together their business processes. We were all very grateful that Eric took the time out of his trip to Singapore in order to help us out at the event. For the most part, I am pretty pleased with how the first couple of events went. It's very easy to sit down and expect all of the demos and workshops and the like to work for all of the attendees. In reality, that's almost never the case though because people will run into issues. Part of the challenge and fun for us is to find a way to deal with them on the fly at the event itself. 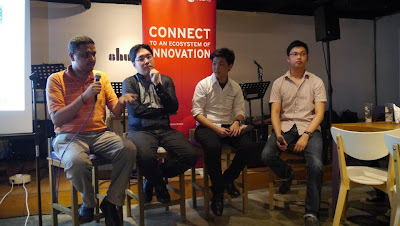 I'm also really happy that Red Hatters from our Singapore office (of varying roles) attended the event to support it. While there is a big technical focus on the content, I believe that it's important that people in non-technical roles can build up relationships with other people within the community. One aspect which I was really happy to see during these workshops was that the attendees were very helpful towards each other. The interactions which we want to build should not be restricted to Red Hat -> Community. We want people to get to grips with our technology and be interested in it as a whole. I believe that there are good signs of this happening. Many thanks go out to everyone who did attend the events, and congratulations to those who managed to win prizes as well. Thanks should also go out to the local Red Hat team, from all divisions, who helped to organise the events along with troubleshoot at the workshops and generally be good fun at the events as well. Last, but not least, it was great that Bruno and Eric could take time out of their schedules to provide and deliver content at the user groups - many thanks to you guys as well! Signing off - until next time! It's a week on from my last talk/demo so I figured it'd be a good time to blog up about it as a break from some EAP hacking. 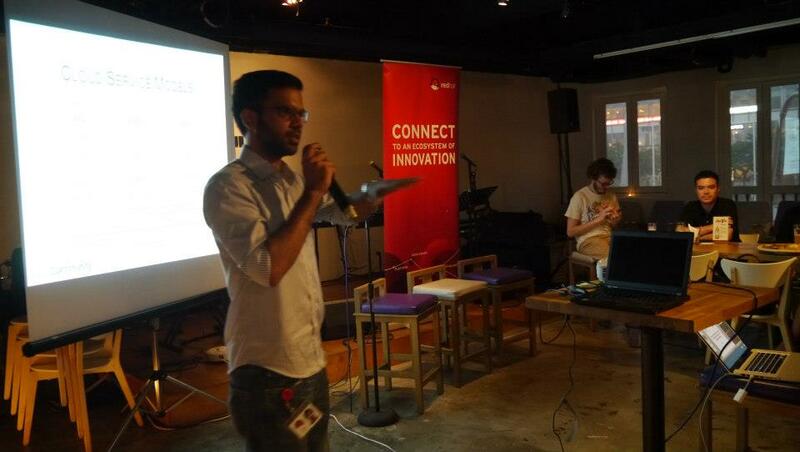 Last Thursday, 21st Feb, we were invited to run a half-hour presentation spot at Singapore's e27 founders drinks for the month. 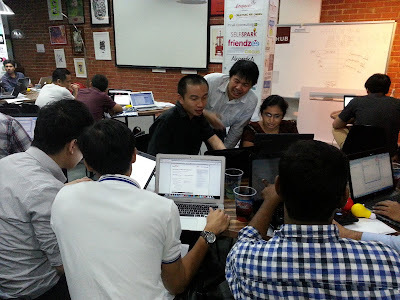 e27 is a media company that is trying to encourage tech start-ups around Asia. In addition to this monthly founders' drinks community event, they report relevant start-up news along with organising an annual conference. This month, since Red Hat were sponsoring the day, I got an opportunity to head out and talk about using JBoss Dev Studio (JBDS) on OpenShift. I wasn't the only person talking to the audience as there was a panel of local start-up CTO's giving a description of their experiences. My talk was pretty fun to do - I wound up running the same demo that I did at Republic Polytechnic but change what I actually spoke about to make it relevant towards entrepreneurs. This time, the Gods of WiFi did smile upon me and mean that I didn't have to revert to tethering my iPhone - I guess prayers do actually help! Comments afterwards along the lines of: "wow you were really patient through that demo" are always amusing to hear. It's pretty important that people realise that a tool like OpenShift can really help with getting their ideas live and 'in the real world'. I do have a feeling that some people did get that message and were curious about OpenShift. I was pretty happy that people were willing to talk and exchange name-cards at the end of the show, their interest can be what drives a new local developer community. Being an entrepreneur can be dangerous business but it can be really rewarding, and I take my hat off to these people giving it a shot. Some very keen Red Hat people in the background looking on. Thanks go to Alan Ho and Lynn Tan who are part of our local Marketing crew who helped with setting things up. I'm really thankful for the trial runs with them and extra pointers I received to help make what I said relevant for the audience. They sorted out DVD's to be distributed to the audience which had an installer of JBDS on it along with this video from a nice man named Marius. Thanks should also go to e27 for getting people to the venue and making sure that we had a sizable audience of about 100 people. The venue? Shuffle at Clarke Quay in Singapore. Cold Kronenbourg, good pizza and a swanky location. Pretty good spot to spend a Thursday evening if you ask me! Summing up - once again it was a pretty fun experience. There were always going to be quite a few people just there for the free food and drink but thankfully they were sat away at the back of the room. I know for a fact that the Red Hat crew present enjoyed themselves and did manage to gain some useful insight from speaking with the local entrepreneurs.